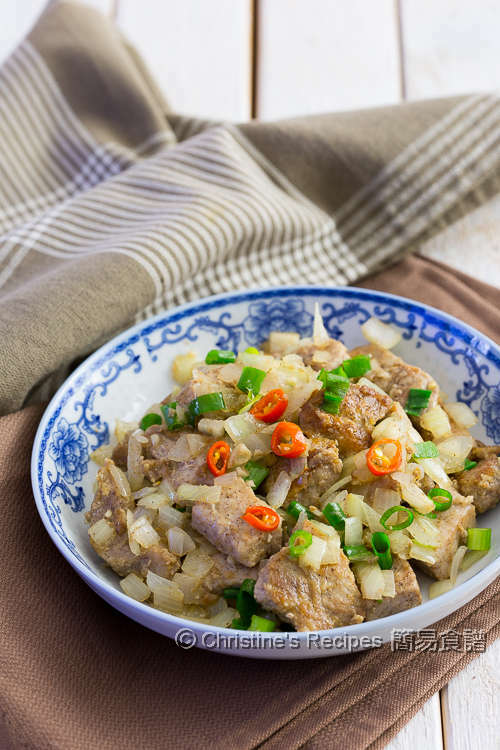 You might find this salt and pepper pork chops dish in some Chinese restaurants. 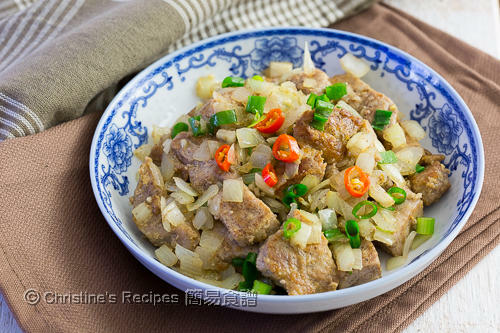 It’s a popular dish and well-liked in Hong Kong. Often times, we’d have this dish at festive celebration occasions. Salt and pepper are the basic staples in any kitchen pantry. They bring up the very taste of every ingredient and help to make many good dishes. To make this dish, it's very easy. You only need a few simple and basic condiments, including salt and pepper, with a pinch of five-spice powder. These tender boneless pork loin chops were turned into a delicious main on our dinner table. At restaurants, the chefs usually deep fry pork chops first, followed by combining with other ingredients. For home cooking, you might like to use less oil. I tried pan-frying instead of deep-frying. We're very satisfied with the end results. Marinating is the very first step and it's very crucial to make your pork chops flavoursome. 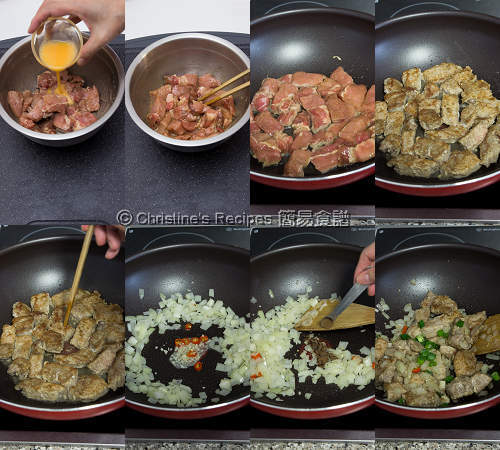 Make sure you pan-fry the marinated pork chops in one single layer in a pan that's heated through enough. Otherwise, your pork chops will sweat and lose juice inside. Pound the pork chops with a meat tenderizer or the back of a knife cleaver. Cut into 4-cm / 1½-inch sized pieces. Mix well with marinade. Set aside for about 30 minutes. Heat oil in a frying pan over medium high heat. 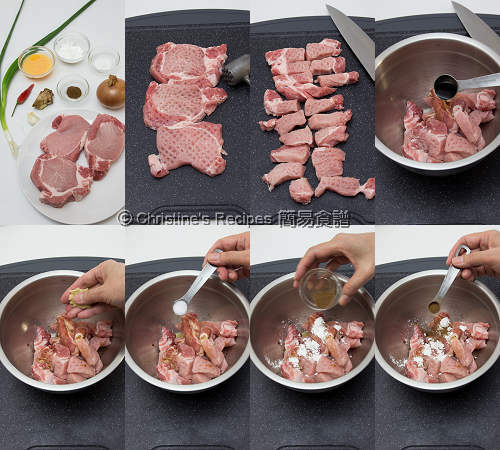 Place the pork chops in the pan in one single layer without overlapping each other. Pan fry until both sides are lightly brown and cooked through. A chop stick can poke through easily. Set aside. Cover to keep warm. Add a little of oil in the same pan and sauté the onion until transcalent. Be sure not to burn them. Push the onion to the sides of the pan. In the middle, add a bit of oil to sauté garlic, shallot and red chilli. Add the five-spice powder and sugar. Toss back the pork chops. Stir to combine. Sprinkle spring onion for garnish. Serve hot. Enjoy! If the seeds of red chilli are removed, the pungency will be decreased significantly. The hotness of different chili pepper types varies. Choose the type of chilli that you like, or adjust the quantity to your preference. Five-spice powder is available at Asian grocers. It has been years since I last had some pork chops. Now you have me seriously crave some. These look tender and delicious. Would it work with chicken or beef? Haven't tested this recipe with chicken or beef. I think it'll work too.